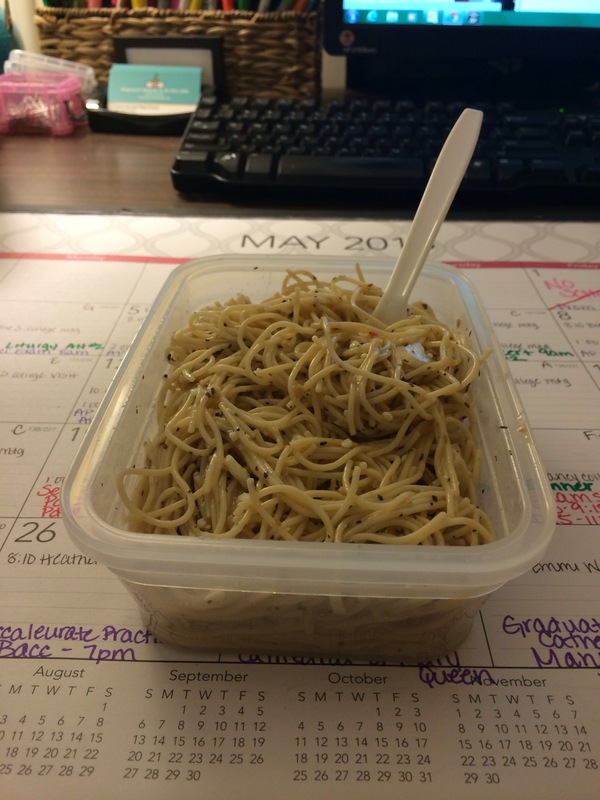 I’ve loved “noodles and dressing” since I was a kid. Don’t get me wrong, I’ll forever love my spaghetti, but there was always something about some pasta with Italian dressing on it that I just really liked. And that was all I ever put on the pasta when I ate it that way, just dressing. As I got a little older sometimes I’d sprinkle on some of the McCormick Suddenly Salad seasoning mix, but I was always content with just “noodles and dressing”. I’m pretty sure I lived on it as a kid. These days I still love it, but usually with more things added. Most of my pasta salads that I make, like my Spinach Pasta Salad, all start with a dressing base of Italian Dressing. It’s just loaded with flavor that I don’t have to try and create on my own. It could be considered lazy. I just consider it delicious. This pasta salad, keeps with my simple “noodles and dressing” love with a couple other ingredients with it like some crisp, sweet onions, herby basil, and a pop of color thanks to cherry tomatoes. Though, I will admit; I do two things to this salad, that some might crucify me for. First, I rinse the pasta before I combine it. Some will probably faint, but it’s a pasta salad, most will say that it’s okay to rinse your pasta to cool it down so that you can make the salad. Please don’t hate me if you’re a non-rinser. I don’t mean to offend you. The other is, I put a little sugar in this. It’s pasta, what? There is a good amount of acid in this; the dressing can be acidic (depending the brand you use), the tomatoes can be acidic and even the onions can have a little bite to them, even though I always use sweet onions for this. Because of this, I usually add just a touch of sugar to temper it all out. You don’t have to add sugar if it weirds you out. But for me, it gives a good balance of flavors, so I like just a sprinkle. But again, don’t hate me for doing these evil things. This is really an awesome salad, that can be made in, literally 15 minutes, prep included. I usually make a big batch and take it for lunch all week. And the longer it sits the better it tastes, so it’s really good to keep around for a few days. Most of the ingredients you probably already have in your house anyway (I usually do) so you can whip it up super fast. And if you use whole grain pasta with fiber like I do, you’ll get a little extra nutrition bump when you eat this, too. Always a plus! 1. Cook pasta in boiling, salted water for about 4 minutes. Drain and rinse. 2. While pasta is cooking, gently warm the dressing over medium low heat for about 1-2 minutes just until it bubbles slightly and is warmed through. 3. Take dressing off the heat and add onions. Stir to combine. Allow the onions to set in the dressing while the pasta is cooking. This makes the onions a little softer in texture and flavor, this is why I warm the dressing slightly because it helps to soften down the onions a bit. But then I take it off the heat so that it doesn’t get too hot because you don’t want to pour hot sauce over the pasta if you’ve already cooled it down. 4. Once the pasta is drained, drop the pasta in a large bowl and combine it with the dressing/onion mixture. Evenly coat all the pasta with dressing and onions. Then add in your basil and sugar (if you’re daring) and toss thoroughly to combine all seasonings and dressing. 5. Gently toss in cheese and tomatoes. Once everything is mixed, you can serve it or set it in the refrigerator. I usually make this ahead but that doesn’t stop me from sneaking a few bites when I make it. It’s good! In fact it’s so good, it has been my lunch this week.